The Composite Order is considered to be wholly a Roman Order. Although the order emerged during the Empire age, it wasn’t until the early Renaissance period that it became a separate – the fifth – Classical Order of Architecture. Some of the first examples of the Composite use was seen on the Arch of Titus (AD 82) in the Forum in Rome and later on the Arch of Septimus Severus (c. AD 204). The Composite Order was another favorite by the Romans – and as so – Composite columns are regularly seen on triumphal arches. The order, itself, is incredibly similar to the Corinthian Order, but the ultimate distinguishing factor of the Composite Order is the capital section of the column, which is deemed to be a fusion of the Ionic and Corinthian capitals. However, there had been debate among classical architects such as Serlio, Vignola, Palladio & Scamozzi in regards to the best name for this order. It has been identified as the “Italian Order,” the “Roman Order,” the “Latin Order,” and – of course – the “Composite Order.” Due to Palladio’s urging of the name, “Composite” (Italian: Composito) – this is the term that has become the customary title for the order as a whole – as it logically makes sense that this order is a composition of the Ionic and the Corinthian Orders. The significance of the Composite Order is connected to the notion held by the Romans of “conquering glory,” simply because many triumphal arches showcased Composite Columns; and it is known that the combination of Roman victory and subjugator’s annihilation was an extremely formalized event (as seen in the construction of large triumphal arches). There is a valid link between the use of a new classical order to denote an independent order that did not precisely copy the architectural styles of conquered nations. The Composite Order, therefore, can be directly correlated to both Roman victory and humiliation of the defeated, and many Renaissance authors have associated this order with the female goddess, Victoria – a winged figure holding a victor’s wreath for crowning the emperor. The Composite Order is classified by slender proportions and has a column height of 10 diameters. The column shaft can either be plain or fluted. Fluted shafts consist of (24) flutes around the column and fillets in between them, with the flutes being rounded off before meeting both the capital and the base. The column shaft terminates downward to an Ionic (or Attic) base that consists of two convex tori (an upper and lower ring) that are divided by a concave section called a scotia. The Composite capital, although similar in certain aspects, is what distinguishes the order from the Corinthian Order, specifically. It has the standard inverted bell-shape platform that is separated from the column’s shaft by an astragal molding. The bell-shape platform is divided into three rows – the bottom two with identical acanthus leaves surrounding the capital. Two small flower accents ascend from the upper row of acanthus leaves on each face of the capital that rest below what is, essentially, an Ionic capital. The third, and uppermost, row of the capital is made up of eight volutes (as characterized by the Ionic Order) that are diagonally positioned to support the abacus at each adjoining angle. The square abacus has (4) concave sides that curve outwardly to a point. Egg-and-dart molding that is typical in an Ionic capital sits directly underneath the abacus and is part of the upper row of the capital. Each face of the abacus is adorned with a centrally-placed fleuron ornament. The Corinthian & Composite entablatures are the tallest of all the orders at a height of 2 diameters, and the latter follows the same details that are seen in the Corinthian entablature. 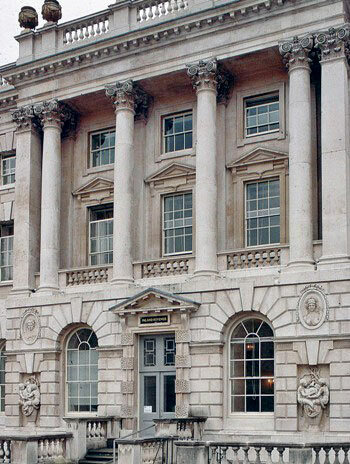 It consists of 3 main parts (bottom to top): the architrave, the frieze, and the cornice. The architrave, in regards to detail, ranged in design – from generally plain designs to extravagant ornamentations. 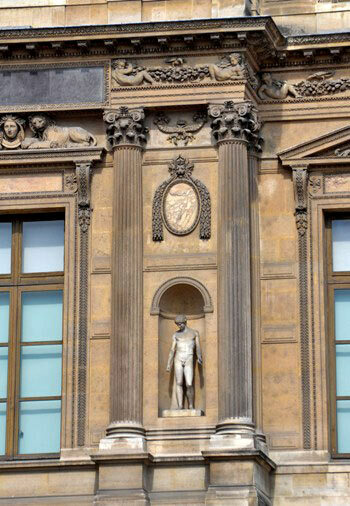 The frieze typically featured a continuous panel of sculpted ornamentation. 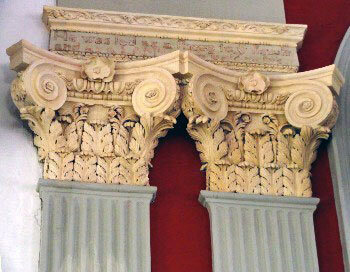 The uppermost part of the entablature, the cornice, was the most distinct section due to its increased embellishments. It maintained the use of dentils but also incorporated the use of bracket-like decorations that were situated under the corona and evenly spaced along the spans of the entablature. The cornice showcased a vast repertoire of circular ornamentations, or modillions, that were highly enriched with acanthus designs. The cymatium was the top level of the entablature, and it extended past the frieze. Overall, the Composite Order displays sumptuous decoration that reflects a sense of triumph and grandeur. Historically, Composite columns were utilized to represent Victory, and they seemingly represent the blending of Wisdom with Beauty. As so, Composite columns are best utilized for projects that call for supreme opulence, prestige, and success.